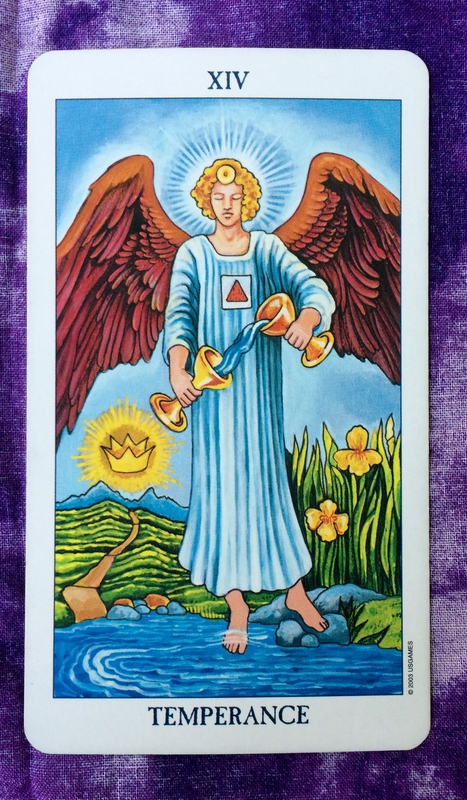 The Tarot cards for today are the Page of Pentacles and Temperance. If ever there was a day to hold steady, this is it. Keep your focus on ordinary everyday activities and balance your energy so that you have a relatively quiet and peaceful day. We have a new moon tomorrow morning, depending on where you are in the world. That will be the time to take the brakes off and move forward wholeheartedly with your new ideas and creativity. The Tarot card for today is the Page of Pentacles. On the one hand, this energy encourages us to stay on task. Focus on practical matters — your job, your finances, your material possessions — and try to stay on the path that will lead you toward the best outcomes. On the other hand, approach each detail with fresh eyes and an open mind. Like a student, learn more about yourself and your world every step of the way. Hi, all. I’m doing something a little different for today only. As I was shuffling the cards for today’s read, two of them popped out. Usually when that happens, I choose to read the card closest to me or the one on top of the other. But today, spirit called on me to read them both. 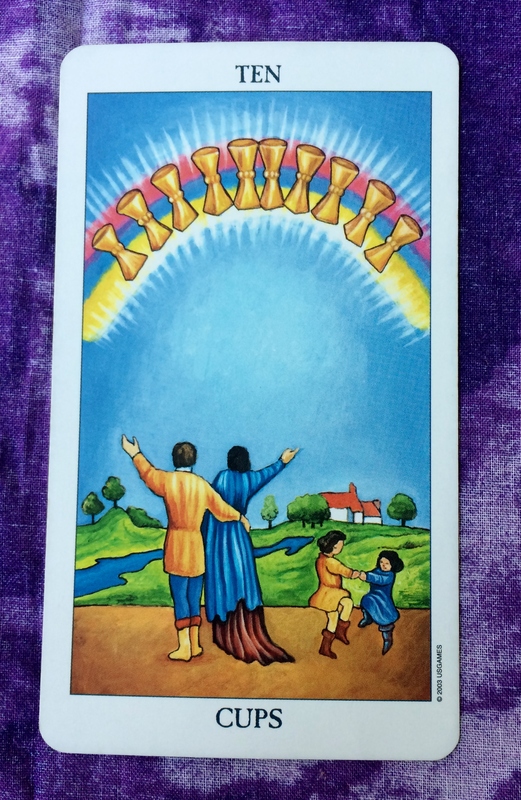 So with the Page of Pentacles with the Ten of Cups, the message is to stay focused on what is important — which is being happy and sharing love with friends and family. You can have a traditional idea of family or you can decide for yourself who your family members are. You may choose to include people who resonate with the vibration of your soul. Most importantly, though, take all the love you shower on others and give yourself at least that much love — if not more. Look at yourself, flaws and all, with total acceptance and no judgment. These are the keys to happiness. So don’t get caught up in distractions such as minor disagreements with coworkers, world events/politics, and celebrity gossip. At least for one day, bring it in. Let’s have a group hug. The Tarot card for today, Saturday, and Sunday is the Page of Pentacles. You may be feeling a little bit restless and bored but now is not the time to go wild. Be conservative this weekend and stick with the routine. There will be a new moon in Aries Sunday evening. That’s when you can look forward to some new positive energy to put your ideas into motion. In the U.S., if you have been putting off doing your taxes, you still have time to get them filed before Monday’s deadline! Get help from a professional if you need it. 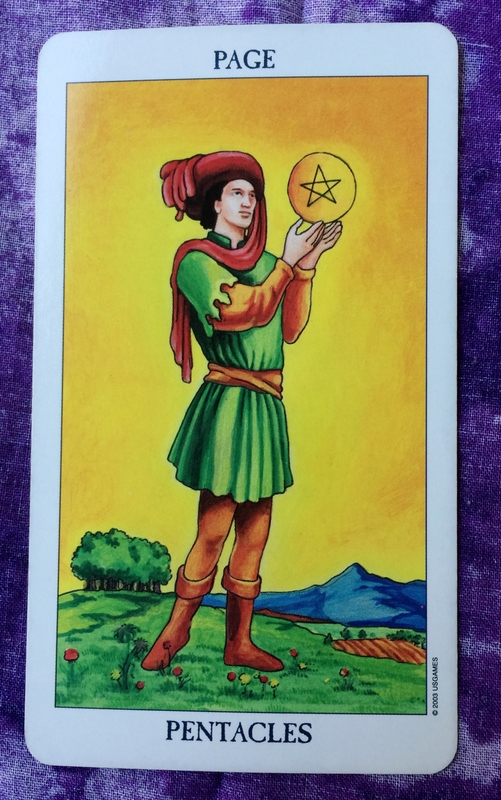 The Tarot card of the day is the Page of Pentacles. As many of you know, today we are having a partial solar eclipse in the sign of Aquarius. Astrologically speaking, this may bring about changes in your life. You may have been feeling a bit unsettled for the past couple of weeks leading up to this eclipse. Today’s Page of Pentacles is telling us to hang in there, even if you are feeling ungrounded. Keep your focus on your goals and all you have to do to achieve your goals. Whatever occurs as a result of the eclipse will be for your betterment. So hold on and keep hope alive! Comments are welcome. Have a fantastic day. The card for today is the Page of Pentacles. The message: Don’t be reckless when it comes to financial investments. Stay focused, keep up the hard work, and build your assets in a methodical manner. 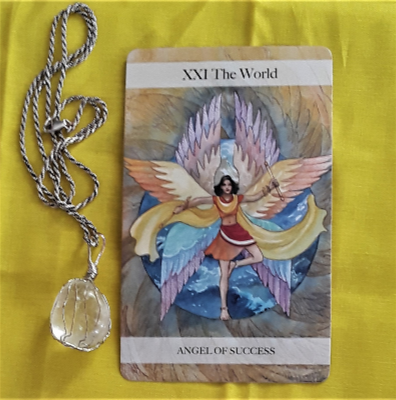 This energy may apply to those of you who are in the beginning stages of establishing your own business or if you have started a new job where your salary has increased. It could apply to anyone who has seen a gain in finances in any shape or form. Think hard before you spend. Make your money work for you. Then, watch it grow! The card for today is the Page of Pentacles. Similarly to yesterday’s card, the suggestion is to say focused. It may be tempting to daydream or to think about everything other than your work. But hang in there. Every minute you spend on the task at hand will take you further along the path to achieving your goals. Then, you can actually do the things you daydream of. The card for today is the Page of Pentacles. You have some goals and dreams. You have been thinking about these things for a long time. Don’t give up now! Stay focused on your goals and make those dreams a reality. This could involve a new business or a new job. It could be a new creative project that requires some sort of skill, especially if you use your hands. If you need to study or take classes to improve your skills, then trust your instincts and do it. It’s time to put in the work. As much as you want to fulfill your dreams, sometimes you may have to do boring grunt work to get there. But push through anyway. Stay on your grind. It will be more than worth it.